Best Royal Wedding Gown, Ever... and More Madcaps! As an Anglophile royalist living in Palm Springs, I celebrated the Prince Harry/Meghan Markle wedding by watching the excellent TV coverage starting at 3:00 a.m., my time. It was worth losing sleep. The dress! In my opinion, Meghan wore the best ever royal wedding gown. 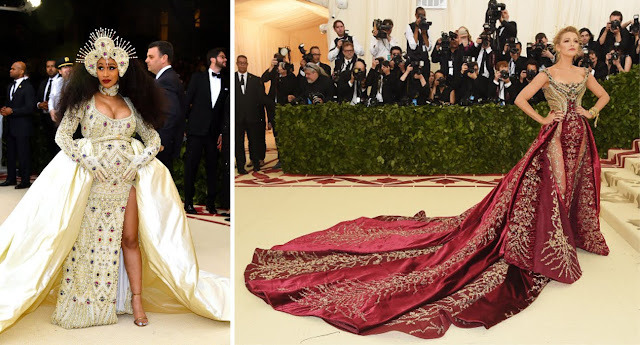 It was designed by Clare Waight Keller, current designer for Givenchy custom couture. In fact, it could have been created by the late Hubert de Givenchy for Audrey Hepburn. No ruffles, no pouffs, no lace, nothing to distract from the clean lines of the slim silhouette, the scooped boat neck and three-quarter sleeves. A smallish tiara (something "borrowed" from the Queen) anchored a long, long trailing veil with a touch, only a touch, of embroidery depicting flowers from 53 Commonwealth countries. Madcap millinery, a British wedding tradition, added to the giddy joie de vivre of the balmy English summery day. The throng of privileged guests looked well-dressed and very pretty, wearing a great deal of delightful color. 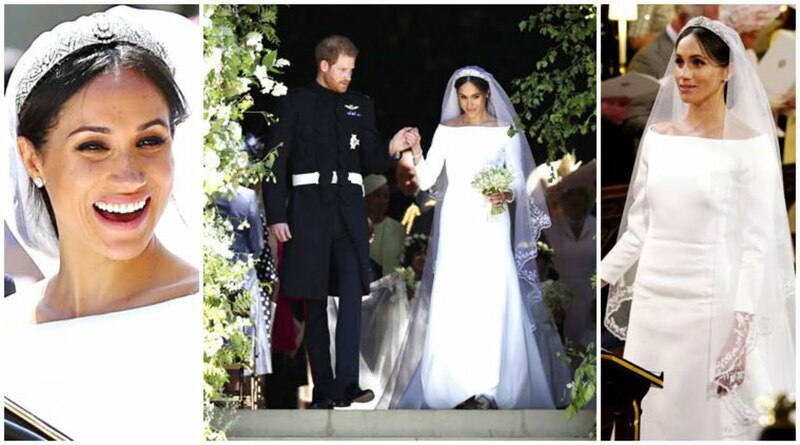 Such occasions as a royal wedding are rare and that’s a shame because it allows us to see fashion that aims to please and to flatter. Will Meghan become a copied style icon? She sure looks promising. Amal Clooney, Camilla and Serena Williams. Oprah Winfrey, Kate Duchess of Cambridge, Lady Kitty Spencer. 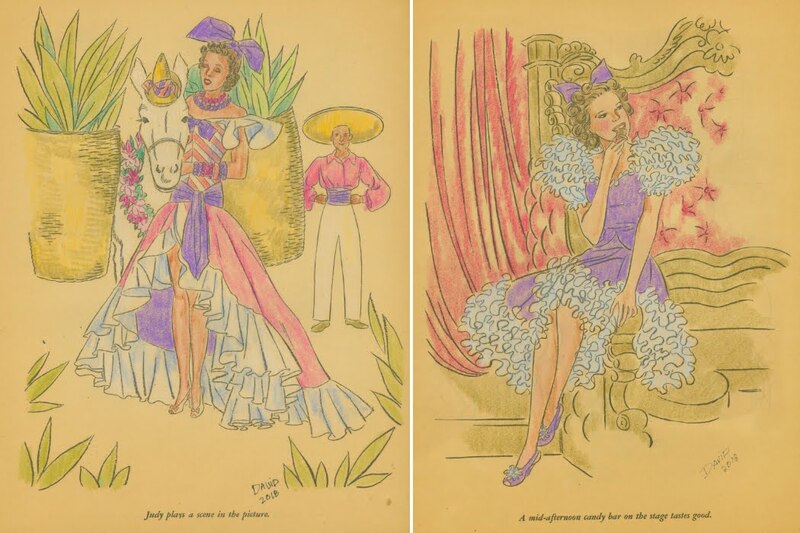 It’s only fitting that the exhibition of Jim Howard’s brilliant fashion illustrations should take place in Denver, the home of the unsinkable Molly Brown, heroine of the Titanic. In the spirit of fashionable Molly Brown, 87 year old Jim Howard, the most dapper gent in Denver, is still going strong and enjoying the recognition and worship he inspires. “Drawn to Glamour: Fashion Illustrations by Jim Howard” is drawing crowds at the Denver Art Museum. More than 100 exquisite, dramatic, artistic, elegant, sophisticated original drawings are displayed. Generous Jim is donating the fashion masterpieces to the spectacular museum. 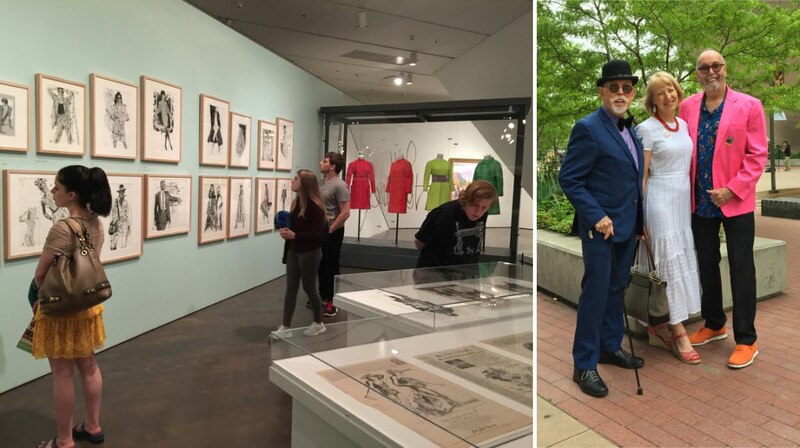 Jim is beloved by the paper doll community and some of his devoted fans journeyed to "the mile high city" to gaze in awe at the illustrations that appeared as advertisements in major metropolitan newspapers, most in the '80s and '90s. Of course I chose my favorite from the wealth of Jim’s impressive career, an unpublished impressionist portrait of famous editor Diana Vreeland. A highpoint of the exhibition that ends August 5, 2018, was the informative and entertaining panel discussion in the Museum’s auditorium one Sunday afternoon. Jenny Taliadoros moderated and the panelists were Jim, Sandra Vanderpool and me, quite an honor. The day after, Jim invited all the visiting paper doll fans to his extraordinary home for brunch and a chance to see where the legendary artist lives and works. What a thrill to see the beautiful work-in-progress on Jim’s drawing board, another book in his "Couture" paper doll series, this one will be about high style in the '70s. Paper Doll fans at Jim’s home and the famed illustrator with his pet, Walter. 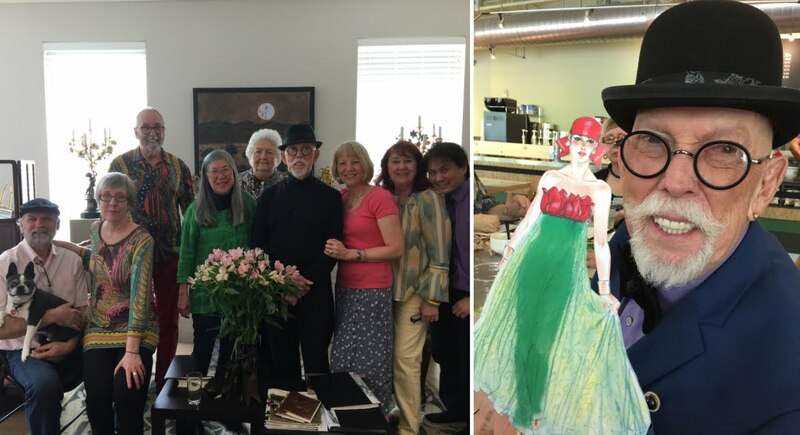 Included in the group were Jenny Taliadoros, Kwei-Lin Lum, Valerie Keller, Bev Micucci, Sharry O’Hara, Michael O’Hare, Betty Kappel, Ron Fong and Me. At right is Jim with his "Fashion Originals" paper doll. The Denver Art Museum exhibition, Jim, Jenny and Me. Jenny and I point out our favorites. The panel and panelists: Me, Sandra and Jim. Jenny and I enjoying the excellent, excellent exhibition. New York’s Metropolitan Museum’s eagerly awaited (well, by fashionistas, anyway) annual Gala presented a questionable theme, this year. It has long been considered wise not to mix Politics and Church. Now we know it is also wise not to mix Fashion and Church, which is precisely what the Met did with an evening dedicated to “Heavenly Bodies: Fashion and the Catholic Imagination.” The usual same over-exposed celebs, desperately seeking media exposure, were decked out in God-awful fancy-schmancy get-ups lavishly embellished. Crosses galore, as expected but occasional surprises like the Sistine Chapel ceiling print. To tell the truth though, most of the Gala attendees just wore nice evening gowns. Vintage Thierry Mugler, current Katy Perry, Vintage John Galliano. Ariana Grande in Sistine Chapel print, Chadwick Boseman and Rhianna. Kim Kardashian, Madonna and Jean-Paul Gaultier, Sarah Jessica Parker. Cardi B. and Blake Lively. 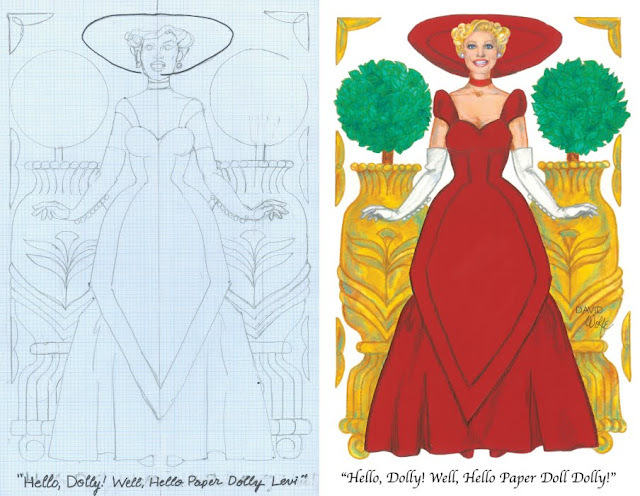 Dolly Levi layout and semi-finished artwork ready to be decorated and embellished at the Convention Workshop. 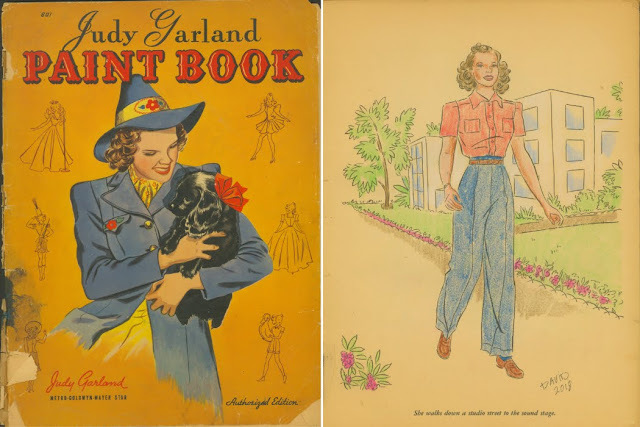 1941 Judy Garland Coloring Book and page colored by Me. Pages I recently colored with soft pencils. Order Your Paper Doll Convention Souvenirs! Note! 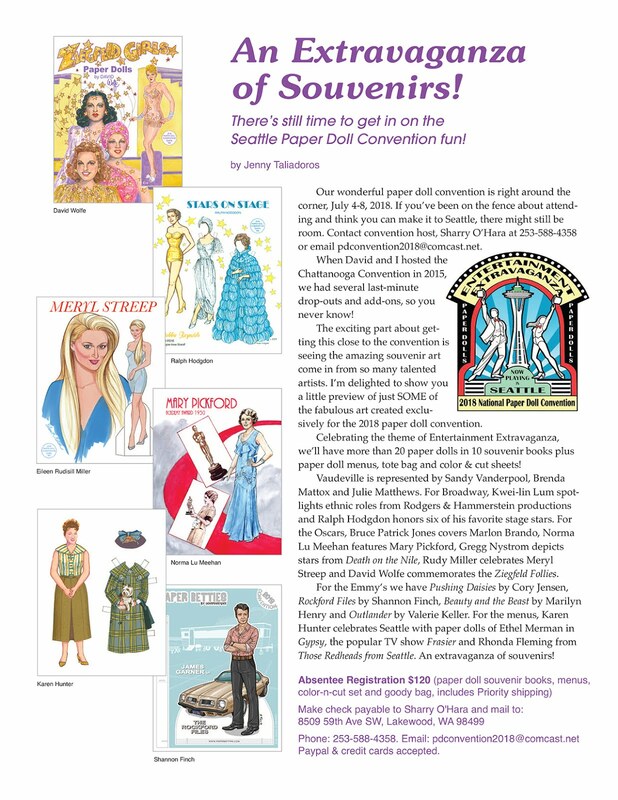 There is still time to order one of the few remaining Absentee packets of 2018 Paper Doll Convention souvenirs. This year’s collection of souvenirs is very special and collectors will be especially pleased. Absentee Registration $120 (paper doll souvenir books, menus, color-n-cut set and goody bag, includes Priority shipping) Make check payable to Sharry O'Hara and mail to: 8509 59th Ave SW, Lakewood, WA 98499. For more information contact Sharry, phone: 253-588-4358 email: pdconvention2018@comcast.net Paypal & credit cards accepted.